If you are visiting us after 10:00am parking spots are available on New Canterbury Road, close to our front door. Short term parking is allowed in our driveway. Emergency parking is available in our driveway. Multiple entries and waiting areas, including outdoor for dogs who don’t like seeing other animals. Cat-friendly reception area and consultation rooms. 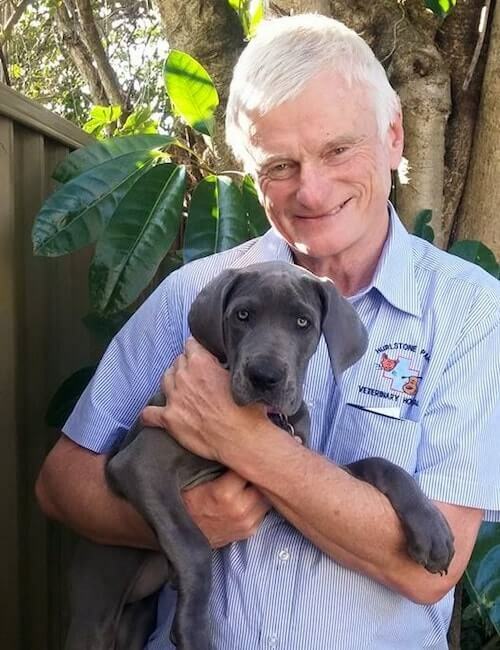 Michael is the owner of Hurlstone Park Veterinary Hospital and has worked here continuously since the 1980s. He enjoys all aspects of veterinary practice and has a lot of experience and expertise in surgery and medicine. Michael has a special interest in animal acupuncture and has treated a vast number of patients over the past 20 years, offering another option for most muscular-skeletal conditions including arthritis, degenerative joint disease etc. On days off he is usually involved in the teaching and workplace assessment of student veterinary nurses in the Sydney metropolitan area. Michael was also a honorary committee member of the NSW Canine Research Foundation for twenty years, including eight years as vice president. He is an Australian Veterinary Association (AVA) Committee Member and he is the 2017 NSW AVA president. Michael’s outside interests include rugby, surfing, skiing, squash, and of course his animals. He has a delightful Great Dane named Elsa who can barely fit in his car! His favourite animal will always be Louisa, a Border Collie cross who went from being a deserted pup to Michaels great companion for sixteen wonderful years. Di graduated from Sydney University in 1995 with first class honours. 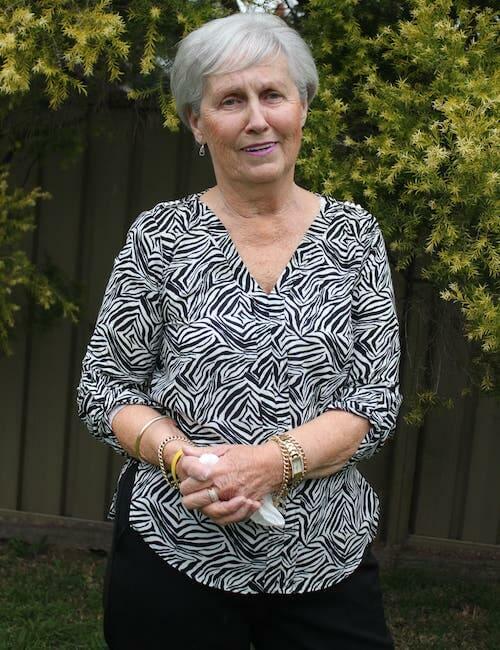 She has worked casually at Hurlstone Park for over 10 years. She works regularly on Mondays. Di is originally from Dubbo and worked in rural mixed practices before moving to Sydney with her husband and four children. She is interested in all aspects of Veterinary Science. Di has a lovely Cocker Spaniel named Bruno who loves playing with her kids. Belinda is our full time associate who joined us after graduating with first class honours from Sydney University in 1998. 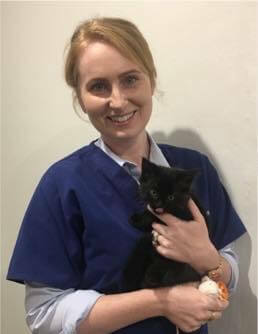 Belinda spent the first two years of practice at Hurlstone Park Veterinary Hospital where she thoroughly enjoyed working with excellent staff, wonderful animals and friendly clients. 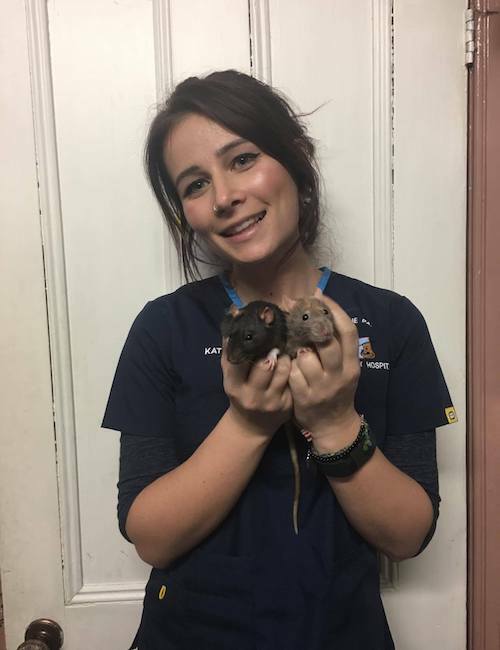 Belinda decided to further her studies by completing a one year internship at the Animal Referral Hospital in 2002 and a further 12 months of distance education in Veterinary Medicine. After this she moved to London where she worked in several practices and gained a wide range of experience. After enjoying life overseas Belinda decided to return home to be with her family. Belinda could not resist coming back to Hurlstone Park and has been with us since July 2011, with long term plans to stay with this happy team. Belinda has a mischievous Cavalier King Charles Spaniel called Bandit who is her pride and joy. Bandit loves coming to work with Belinda and his happy personality charms staff and clients alike. Kate graduated from the University of Sydney with first class honours in 2013. She enjoys consulting, working on medical cases and behavioural medicine. She worked for several years at the RSPCA and remains passionate about animal welfare and rescue. Prior to studying veterinary science, Kate was a corporate lawyer (but don’t hold that against her!). She loves to ride horses, visit the beach and run in her free time. She shares her home with a very noisy tuxedo cat called Billie-Jean, a fiery fluffball called Amy Winehouse and an incredibly sweet but very nervous rescue Great Dane X called Archer (oh, and her husband and two small human children as well). Ben has worked at Hurlstone Park on a part time basis since 1997. He regularly consults on Mondays. Ben enjoys performing surgery and has an interest in orthopaedics. 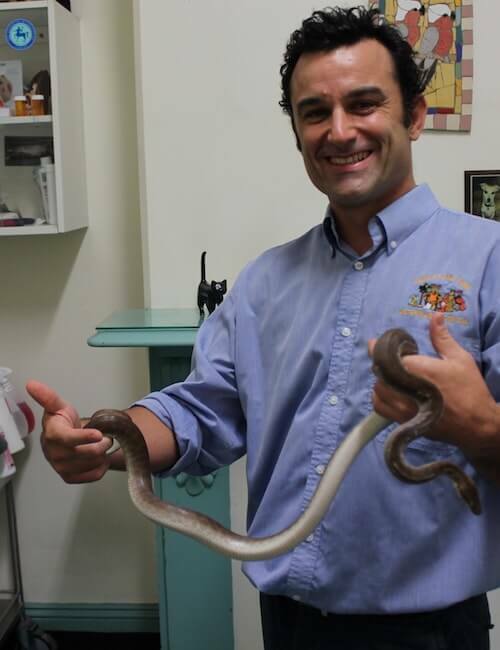 Ben has travelled extensively overseas through Europe, Africa and the Middle East where he was working as a vet. He has had exposure to a range of exotic animals and currently has Aphrodite, a childrens python sharing his home. Ben also has Holly (full name: “Holy Moly Supa Holly”) who he describes as the most astounding Burmese cat he has ever known. He has an interest in education and works at TAFE, teaching veterinary nurses the skills and knowledge required for their qualifications. Ben is a keen golfer and tries to play the guitar when he has time. Judith studied Vet Science at Bristol University in the UK. After working in various practices over there, she came to Australia in 1998. 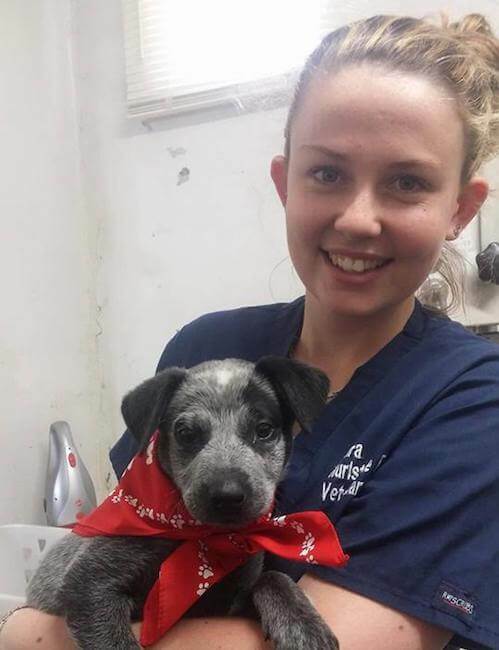 Since then she has worked in small animal practice in the Inner West as well as passing her exams in Animal Behaviour to become a member of the ANZCVSc. Needing flexibility to travel to the UK for family reasons, Judith feels lucky to have joined Hurlstone Park Vets in early 2015. Judith is loving working at Hurlstone Park Vets. She says the attitude and care towards both animals and clients is fantastic and thinks the clients and their pets are great too. Judith enjoys medicine and surgery as well as treating animal behaviour problems. She has shared her life with a number of rescue dogs and cats- presently a cute Schnauzer called “Baxter” who loves begging for food during our lunch breaks and “Gilbert” a handsome ginger cat. Lou has been working here since 1985. She has had the occasional time off to have three children and work as a registered human nurse. Lou’s children love coming in to help with all the animals. She has a large menagerie of animals – Willow the Labrador, April the cat who was adopted as a stray, Koonama the budgie, Tyler the Jack Russell Terrier and two horses Argo and Piefer. For Lou the best part of working here is seeing pets regularly and getting to know them and their owners. 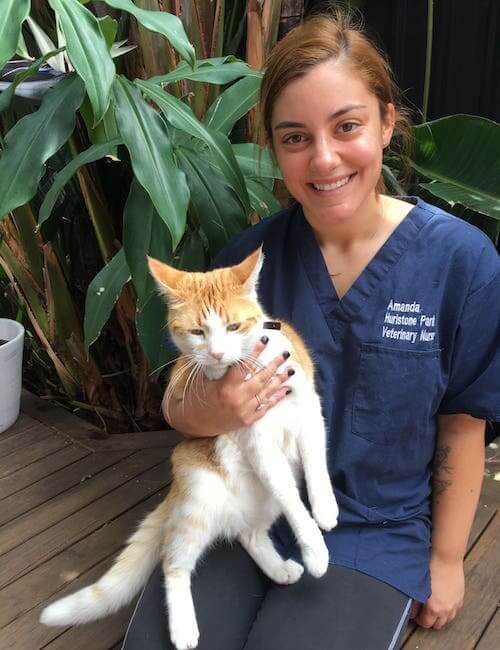 Amanda completed Certificate II in Animal Studies and Certificate IV in Veterinary Nursing at Bankstown TAFE and has been working at Hurlstone Park vets since 2011 . Amanda has a soft spot for ginger cats. She has a cat called Harlem who was an abandoned kitten. He is more like a dog than a cat, they go for walks together on the bay and he collects socks! Amanda hopes to get a rescue dog in the near future and take him to the beach and inner west cafes. 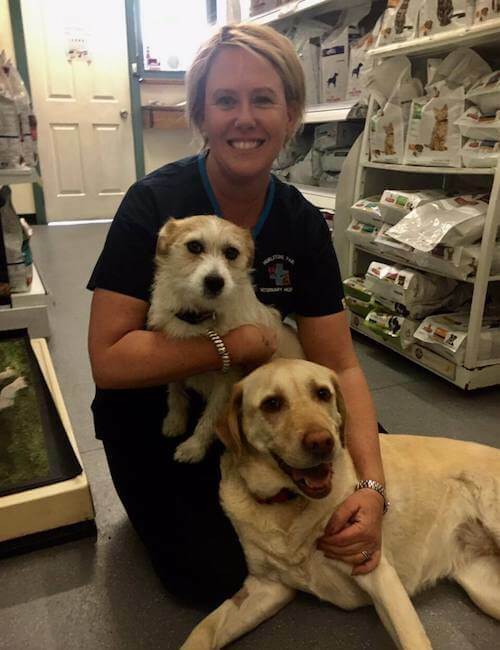 Sweetlana has completed Certificate II in Animal Studies, Certificate IV in Companion Animal Services and Certificate IV in Veterinary Nursing at Bankstown TAFE, and she has been working at Hurlstone Park since 2011. 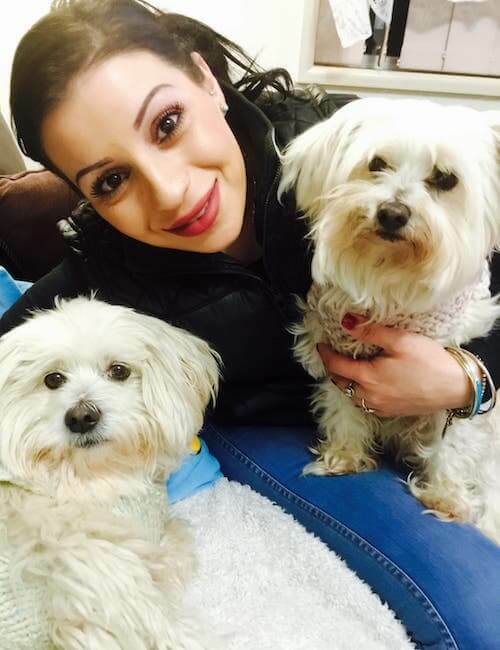 Sweetlana shares her home with two Maltese Shihtzu dogs named “Jessie” and “Sandy” who often come to work. Jessie seems really sweet but can be protective of her favourite chair at work! Sweetlana has been working with animals since 2006. Her main interests are surgical nursing and intensive care. In her spare time she enjoys catching up with friends and having a laugh. 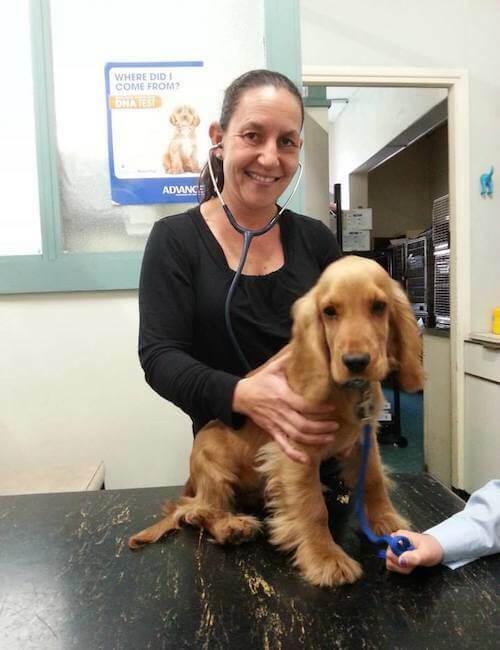 Tara has been working at Hurlstone Park vets since early 2010. 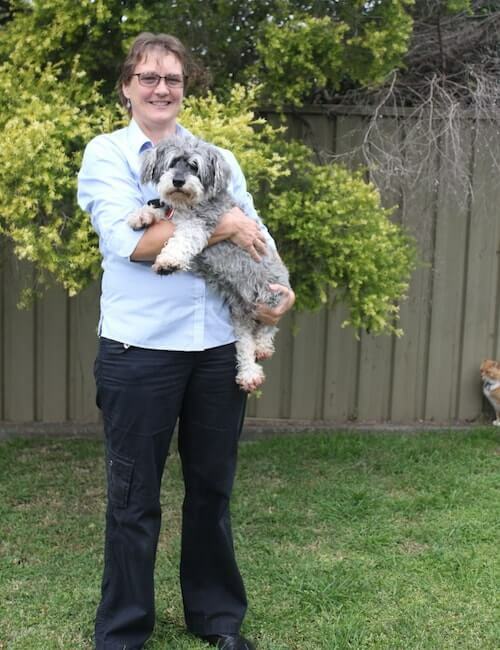 She has completed a Certificate II in Animal Studies, Certificate IV in Veterinary Nursing, Certificate IV in Companion Animal Services and Certificate III in Captive Animals at Ultimo TAFE. Tara’s love for animals started with her constant companion Rusty, a red Cattle cross Kelpie dog. Tara now has an Australian Cattle dog named Angus who is a bit of a sock thief. Her main interest is animal health and welfare and sharing knowledge with owners to assist them as much as possible. She also enjoys dental work, assisting with acupuncture patients and is in charge of our drug and product management. In her spare time she likes to keep active playing sport and enjoying the outdoors. Maureen started working here in 1973 and has been senior receptionist for most of that time. We suspect this may be a record in veterinary hospitals! Although Maureen works on a casual basis these days we still consider her the backbone of the practice and she is invaluable for her knowledge, organisational skills and wonderful temperament in all situations. Kat is currently studying to obtain a Bachelor of Vet Biology/Doctor of Veterinary Medicine. Kat says being a vet has always been her dream. 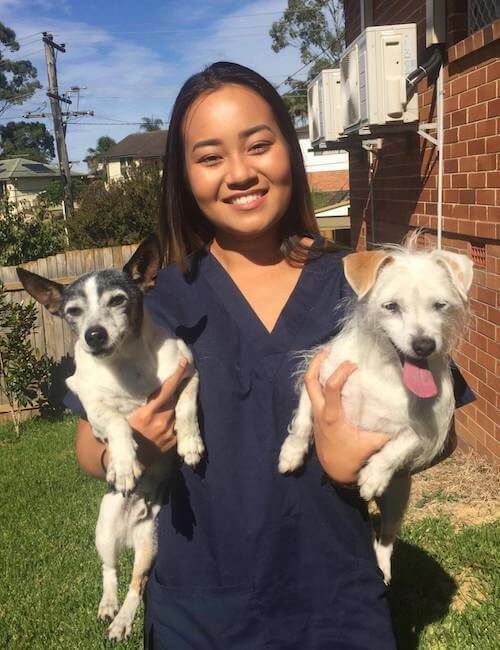 Working at Hurlstone Park Vets has been such a great opportunity to learn and get experience. Kat grew up In the Hunter Valley on a horse stud. Her parents breed warmbloods and have recently started breeding miniature goats! Kat has an interesting array of pets which include 3 rats named “Maple”, “Bacon” and “Moose”. She also has a cat named “Tabitha” and her newest member, a Guinea Pig named “Pancakes”. Kathy first started at Hurlstone Park by volunteering on Saturday mornings but has recently joined the team! 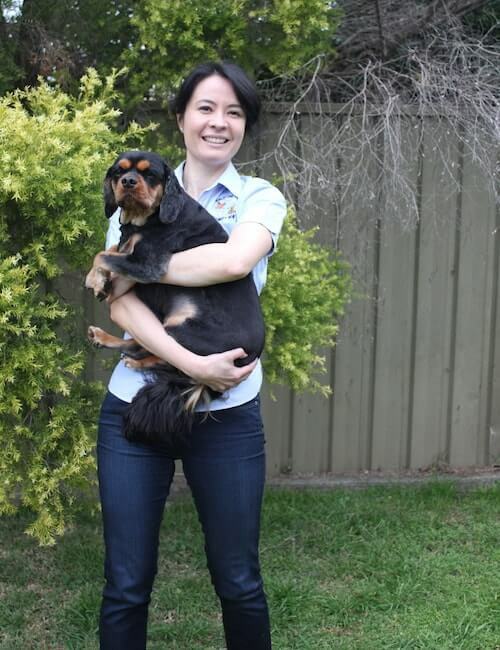 Kathy is studying Doctor of Veterinary Medicine at the University of Sydney. She has two little fur babies, “Grover,” an old Mini Fox Terrier, and “Bambi,” a cross breed (no one knows what she is!) They are both rescue dogs from the RSPCA. Kathy says she loves how affectionate, loyal and carefree animals are. 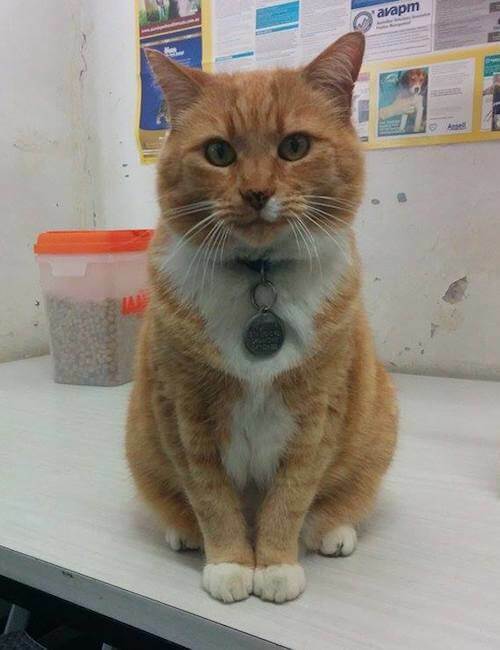 Nummy has lived here at Hurlstone Park Vets since 2015 and is quite a character. He is possibly one of the most confident and friendly cats you will ever meet. Prior to moving in to Hurlstone Park Vet, Nummy lived with Nurse Louise’s mother, Fay. He was rescued as a kitten and had been mistreated but luckily Fay took him under her wing. He continues to be an adored and spoilt member of the Hurlstone Park Family. Hurlstone Park Veterinary Hospital is dedicated to providing the best possible health outcomes for your pet. We will provide advice and care that aligns with best practice. We recognise the positive impact pets have on the lives of their owners and endeavour to improve the relationship between owners and their pets. People and pets have a large impact on the local and global environment. We seek to educate owners on environmentally responsible pet ownership.